G o t o L a n d s c a p e O n l i n e . c o m a n d s e a r c h G l a c k i n T h o m a s P a n z a k t o v i e w m o r e f i r m p h o t o s 120 Landscape Architect and Specifier News Glackin Thomas Panzak, Inc. Paoli, Pennsylvania Courts at Spring Mill Station Whitemarsh Township, Pa. The Courts at Spring Mill Station project, located just outside the city of Philadelphia, successfully transformed a former industrial site into a transportation oriented development providing residents and the public with direct access to the adjacent Spring Mill Train Station, the Schuylkill River Trail system, and engaging views of the Schuylkill River. The 7.8-acre site contains 385 apartments, public and private amenity courtyards, a place making sculpture, reinvigorated streetscapes, and a re-purposed 1770 historic house now enjoyed as a bike shop and café. 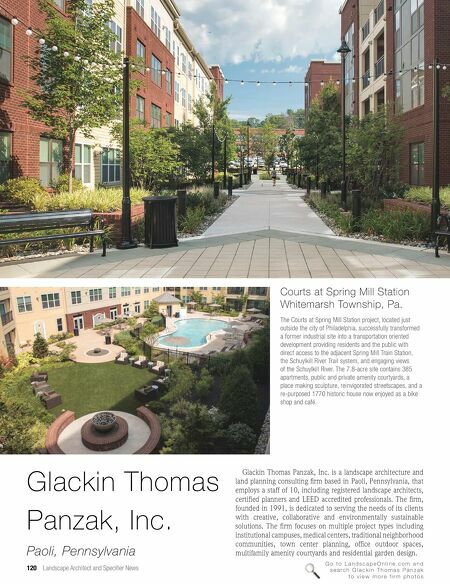 Glackin Thomas Panzak, Inc. is a landscape architecture and land planning consulting firm based in Paoli, Pennsylvania, that employs a staff of 10, including registered landscape architects, certified planners and LEED accredited professionals. The firm, founded in 1991, is dedicated to serving the needs of its clients with creative, collaborative and environmentally sustainable solutions. 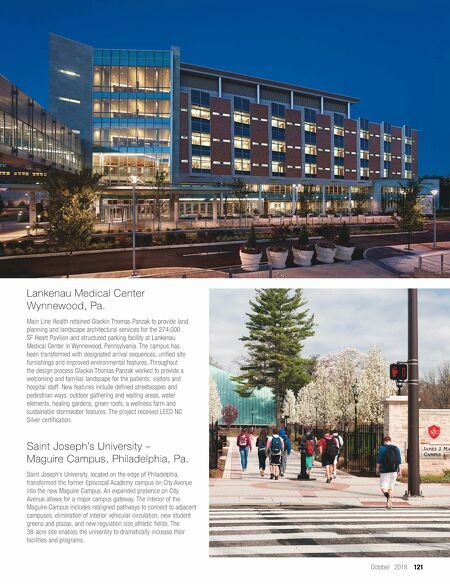 The firm focuses on multiple project types including institutional campuses, medical centers, traditional neighborhood communities, town center planning, office outdoor spaces, multifamily amenity courtyards and residential garden design.